With the kids going back to school it is the perfect time to think about getting monograms on your favorite accessories and display your school mascot proudly! Get your favorite monogram on iPad cases, backpacks, apparel, and more! Enter to win a Miss Lucy’s monogrammed prize pack for you and a friend! 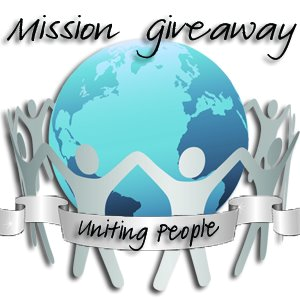 Grand Prize: miss lucy’s prize packs! 1 for YOU and 1 for a FRIEND! Welcome to miss lucy’s monograms! 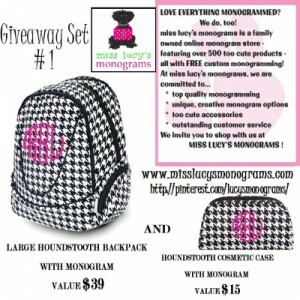 We are an online business dedicated to providing you with top quality, distinctive, and unique monogrammed accessories that scream,”tooo cute” for every age!! 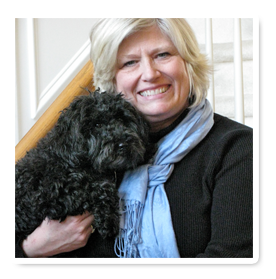 As a teacher of 33 years, I recently made the decision to retire from the occupation I loved dearly, but I turned my focus to starting a business selling items that I have always loved… monogrammed accessories! With the help and support of my family, miss lucy’s monograms became a reality, and our company has had an amazing journey. Every day is an exciting one in our monogram studio as we prepare orders to be shipped throughout the United States. At Miss Lucy’s Monograms, our goal is to be a highly reputable, service oriented, and creative company. We strive to provide you with unique, top quality products and exceptional, creative monogramming service…we want to be a step above the rest ! Our staff is committed to offering outstanding service to all our customers! Above all, we hope that you find shopping at miss lucy’s monograms an enjoyable experience, but most of all, we hope your purchase from miss lucy’s monograms will put a smile on your face! The Giveaway will open up on Tuesday 8/14 at 12:01 am EST and Close on Friday 8/17 at 11:59 pm EST.